Hidey-ho, minna-san! You didn't think we'd let the site's fifth anniversary pass without comment, did you? Yes, it's been five years since we first opened our virtual doors on January 25, 2004. (Much of the early site content was online since 2003, though, and some people were able to access it via Google... so technically Jax is correct.) I wasn't sure I'd still be doing the site in five years, but here I am! Will Scary-Crayon still be around in 2010? Let's hope it survives in some shape or form. Alrighty, that'll do us for now -- hopefully I'll have more in a few hours, In which case I will simply update this post. TTFN! And now (after I get the front and content pages updated, anyway) it's back to work to see if I can't get another article up! Doesn't look like it'll be ready before midnight for those of you on the East Coast, but it just might make it for West Coasters. 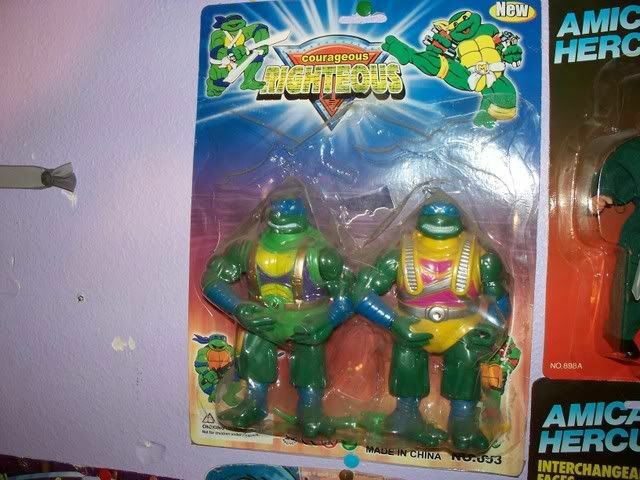 In any case, while these TMNT bootlegs are pretty awesome, believe me when I say that the best -- and weirdest -- is yet to come. UPDATE: So I didn't make it in time for the West Coasters, but here it is: a review of the greatest coloring book of all time. I really love this book, and I seriously feel proud to have posted this article. Is that weird? I think it's weird. I almost never feel proud, but today's articles have stirred those feelings in me. Except, of course, stuff that it doesn't love. i haven't had the chance to look at the content yet.. that'll come later tonight and in the days to follow.. - but, did want to make a quick comment and say congratulations, wes! S-C is one of the few sites i visit regularly and i really appreciate it because its so unique.. - looking forward to '09! Brian: Thanks! Here's hoping that you are entertained when you get around to reading the pieces. Hopefully I'll have more for the site in the days to follow as well! Thanks for sharing, Stephan! Where did you happen to find those? HAPPY SCARY-CRAYON FIFTH ANNIVERSARY, WES! Yeah, I haven't been here in awhile because after watching the Appleseed films (which I highly recommend, especially Appleseed Ex Machina), I decided to learn CG animation. So far, it's a lot of fun, and some of the projects I had been planning to do in flash, I'll probably be doing in Blender (www.blender.org), instead. Anyway, back on topic, those "Courageous Righteous" figures are really pretty neat. I like it when someone injects a little creativity into what is otherwise a rip-off bootleg. Those would be the next best thing to having an Our Friend Power Five toy! The coloring book was kinda neat, too. And, it's another great example of adding some creativity to a knock-off. It would seem weird that the publishing company would sue somebody though. "Glass houses" and all that. Happy Birthday SC! You brighten my day! (nyuk, nyuk) Sorry I wasn't counting years when I made the switchplate; I only glanced at the copyrights at the bottom of your pages. Lots of great articles from you lately, Wes! Live long & prosper! Tetsu: Thanks for the well wishes! And Blender, eh? I swung by the site and saw two of my favorite terms when it comes to software: "free" and "open source." I look forward to seeing whatever you come up with! Also, with respect to the company's lawsuit, technically you can't trademark generic monster balls... so it's not as if Scary Faces was in violation of any copyrights or trademarks that I know of. Back then, there were probably at least three different mass market lines of monster balls (besides the generic discount knockoff stuff), with maybe a couple more that followed in the early 90s. Monster balls were hot. Stephan: Ah, eBay. Is there anything you can't buy on there? Jax: That's cool -- I figured that that's where you'd gotten the year! 🙂 And thank you for the well wishes and compliment as well. Hopefully SC articles will continue to brighten your days in 2009 and beyond! Hiya Wes, Twinbee from the Technodrome forums. Just thought I'd post that I believe I've found the origins of our bootleg buddies here. They look to be taken from "Street Surfin' Leo" from the Next Mutation line : http://www.tmnttoys.com/97figu...../33101.htm It seems to match all the various versions of Courageous Righteous. Hope this helps you out, and keep on bootin'.